Meowth is unusual among other Pokémon for its ability to speak like humans. 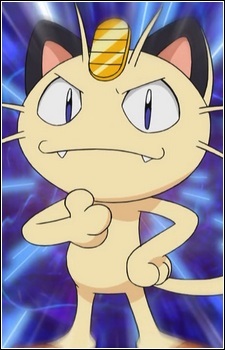 During the earlier episodes of the series, Meowth liked to think he was somewhat in charge of the group, and was responsible for many of its plans and objectives. Most of Meowth’s background story is explained in the anime episode "Go West, Young Meowth". Meowth came to Hollywood on the back of a truck after seeing a film called "That Darn Meowth" dreaming of good food as seen in the film. He eventually joined a gang of stray Meowth led by a Persian. One day, he fell in love with a female Meowth who let him know that she preferred being with humans to being with a street Pokémon. To impress her, Meowth learned to walk and speak so as to be as much like a human as possible. Afterwards, however, the female Meowth looked down on him even more than before. After Meowth joined Team Rocket, she was abandoned by her owner, and joined the same gang that Meowth left. Ultimately, she fell for the Persian that led the gang. Meowth is an integral part of the team, counting Jessie and James as his only real friends, but he is often excluded from the rapport between the two. When he lured Pikachu to their side in an episode, he seemed to have his own agenda as to what to do with it. Often, he explains why they should capture the main Pokémon of a particular episode, by indulging in an unrealistic fantasy of Giovanni’s reaction to their success, such as in, "Beg, Burrow, and Steal", when he suggests stealing Trapinch so Giovanni can use him to crack walnuts. It is possible this is an unhealthy coping mechanism, as James comments that these fantasies proved Meowth had "officially lost it". Meowth is essentially the "brains of the outfit" and appears to come up with the majority of the team’s plans; he seems to share his species’ thematic association with money, often being the one most concerned with practical issues such as the dismal state of the team’s finances. Because of this, Meowth is usually the one who operates Team Rocket’s Pokémon-stealing machinery, working in the background while Jessie and James confront the protagonists. Starting in the Johto season, Meowth learned to pick locks to aid their criminal lifestyle. He is also skilled at piloting the Team Rocket hot-air balloon (and other getaway vehicles). Among other things, he is also able to sing, dance, read, and write - skills that Pokémon rarely possess. Being able to understand what Pokémon as well as humans are saying, Meowth also often translates their speech for Jessie, James and other characters. Meowth was shown to care greatly for Misty's Togepi when it was an egg. He willingly battles for the right to raise it, and wishes Togepi happiness with its new owner. Later on he was infatuated by May's Skitty, and helped her escape, contrary to Jessie's plans. He has also remarked that if he had met Pikachu under different circumstances, they might have been friends. On occasion, Meowth befriends other Pokémon (usually ones that are outcasts like him) but by the end of the episode he is separated from his new companions. He also seems to have a good relationship with Jessie and James' Pokémon. In Pokémon Yellow, Meowth is one of the Pokémon that the player must defeat when fighting Jessie and James. This however runs contrary to the anime as he, unlike most Pokémon, is not trained or owned by either Jessie or James and rarely battles. One of the trophies in Super Smash Bros. Melee is "Team Rocket's Meowth". When viewed, it says that Meowth's dream is to become a rock star. This dream was also shown in one of the Japanese ending songs as well as a special CD released only in Japan. The plot of one Pokémon short revolved around him throwing a concert for his fellow Pokémon. In Pokémon Channel Team Rocket's Meowth acts like an emcee or newscaster. An armband he wears references a line from the Japanese motto. Anime Henchmen often serve as a mere hurdle for the heroes, but nonetheless one that they must overcome in order to face the true villain of their story.